When I went into the ARRL international DX contest, the first station that I heard was K3WW. 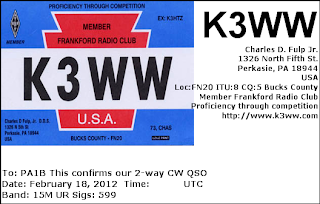 K3WW is a station with Excellent Ears. The signal of Charles was stronger than the usual S8. The signal was over S9, so I decided to try a lower power than the usual 360 mW and I switched to 36 mW, using a 10 dB attenuator. I expected that I had to use more power, but to my surprise we made the QSO with just 36 mW in CW, using an Inverted Vee. My FT-817 only gives 360 mW instead of 500 mW after a serious mismatch, but I still have great fun with low power and 1000 MPW. The distance between my QTH JO22na and K3WW in FN20ii is 3725 miles. With 36 milliwatts this gives 103000 Miles per Watt. Thank you Charles for the fine QSO. Hpe cuagn in the next contest. I just sent in my Cabrillo file for the CQMM DX contest. I had some trouble to make the entry. I logged on paper and made a Cabrillo file in Excel. But the robot refused my entry based on version 2. So I used an online webform to make the Cabrillo file in version 3. We were invited out for a birthday, so I only had time on Saturday and only made one QSO before we left on Sunday. I used the Lowest Possible Power in each QSO. I started, late around 19:45 local time, so the propagation to Europe was good. At first I made some more than 1000 Miles per Watt QSO's in Europe. About one hour later the signals from North and South America came through. The signal of N2MM was stronger than S9. Carol was S8 through the 10 dB attenuator, so the QSO could be made with 80 mW. The exchange was 599 NAY . The Y means YL. 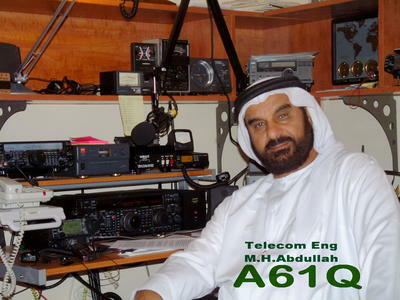 Later AA3B was also worked with 80 mW. It is years ago that I met AA3B with just less than 100 mW, so you don't hear me complaining about the propagation. hi. This CQMM DX contest brought 3 new DXCC's: FM, OX and CE. Martinique with 360 mW, gives a very nice QRPp more than 1000 Miles per Watt QSO. This survey, showing the bands is also interesting. To North America was slightly less power needed at 15 m than on 20 m. Notice that the difference between 80 mW and 360 mW is just ONE S-point. 4x is 6 dB is one S-point. By comparing the info in both tables, you can find out, on what band each DXCC was worked. 21 out of 28 QSO's were more than 1000 Miles per Watt QSO's. This is a staggering 75%. Blogger has changed the navigation to make a new Blog entry. They changed it in a way that the Internet Explorer is NOT working. I have used the Google browser Chrome for a while. But the Chrome cuts and pastes differently from Internet Explorer giving problems with in copying and pasting of tables and data from lists, like the WSPR database. So I already went back to the Internet Explorer. Now I must use the Google browser, if I want to make a new Blog entry. So Chrome is still installed, but for all internet surfing I only use the Internet Explorer. Sudenly my standard browser is not good enymore for Blogger. So I can not place my new entry about the first results of the CQMM DX contest. The CQMM DX is a very special contest for QRP sytations. A QRP station is recognized by it's exchange. E.g. SAQ meaning South America QRP. So as a QRP station you immediately known, that the QSO is a 2 way QRP QSO, when you receive such an exchange. Last year I had great fun in the CQMM DX contest. Look at this Blog entry of 2011. In the CQMM DX contest of 2011, I was surprised by the excellent propagation, which made it possible to work with stations in South America and North America with just 1 W or 2.5 W.
Next weekend there will be much activity from South America, so join the fun in the CQMM DX in which you can work every station. After this QSO I stayed on 18 MHz and made a QSO with EA5AR using 2.7 W. Ric gave 549 with QSB. Then I heard A61Q calling CQ DX on 15 m. With a distance of just more than 3000 miles, according QRZ, I choose a power of 2.7 W.
Now several stations were answering and at first I mingled with these other stations, but without success. With 2.7 Watts, I am not the "Pile up King", so I decided to wait for the right moment to give my call and in the mean time I listened to the mode of operation. This payed off, much sooner than I expected.